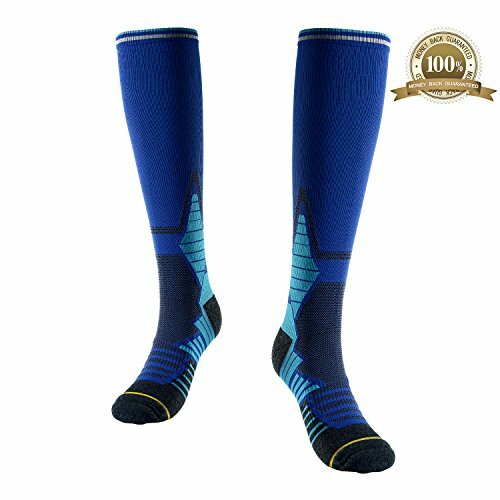 COMPRESSION SOCKS FUNCTION -Compression socks can put pressure on your legs and veins. The pressure it puts on the legs makes the blood circulate faster which helps reduce the diameter of all dilated veins and increases blood flow to the veins. ERGONOMIC DESIGN-15-20 mmhg compressed socks fit perfectly from your toes to your legs, energizing your skin. Comfortable and breathable fabric reduces your muscle aches while you exercise, adding comfort to your body. Compact weave design in ankle fabric area acts as a cushion to reduce muscle vibration and fatigue and prevent sprained feet. FASHION COLOR & MAKE FUN IN LIFE - Deodorant and anti-static fabrics prevent the growth of bacteria and fungi while absorbing moisture/sweat from the feet. Keep it dry and dry even when used for a long time, add a touch of color to your ordinary life.